Pasch & Sons Construction Company is a second-generation, family owned company with extensive experience in the construction industry. Throughout our 65 years of business, we have developed a solid reputation for quality workmanship and timely construction in the southwest suburbs of Chicago. Henry Pasch, a World War II veteran of the U.S. Army Corp of Engineers, founded our company in 1950. Using his knowledge from the USACE, Henry began his work in residential housing before transitioning to commercial construction in 1970. 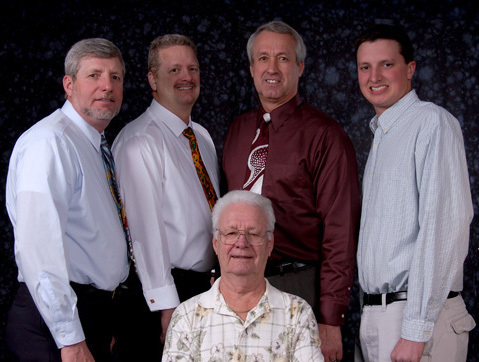 He became partners with his three sons Jim, Jerry and Jeff in 1981. Today, Jeff continues to implement their father’s passion for construction, his dedication to family, and his insistence on quality of service, hard work, and responsiveness to client needs. As a mid-sized construction company, Pasch & Sons provides general contracting services, general trades packages with construction managers, and design-build services. We specialize in rough and finished carpentry, metal studs, drywall, suspended ceilings, installation of commercial hollow metal frames, doors and hardware, and composite metal panels. We have also been installing wood roof blocking for area roofing contractors for over 30 years. Pasch & Sons believes that it takes a dedicated team of owners, architects, engineers and subcontractors to make your project a success. Our strong relationships with experienced companies in the construction industry enable us to provide superior quality and performance. We are passionate about construction and take pride in each and every service we perform. You can always look to Pasch & Sons with confidence and trust. Our commitment to you remains the same: professional, timely and cost-effective service with each and every building project, always completed to your satisfaction.